What are the layers of the salad "Herring under a fur coat"
The history of salad "herring under a fur coat"
Herring under a fur coat has become a tradition for almost any holiday feast. It is prepared for birthdays, Christmas celebrations, anniversaries and other events. Mistress Excel in the preparation of coats, bringing in a dish with new ingredients. And once again from herring under a fur coat will amaze you with its novelty and taste. Salad "Herring under a fur coat"
- mayonnaise – 150 grams. This salad is very tasty, but many have become accustomed. How is it possible to elevate the dish to the coat turned out delicious, and herring became a little naughty? For a more juicy and tender lettuce you can use herring in the preserves. It is impregnated with spices and butter. Between the layers of vegetables can be alternately used along with mayonnaise and oil preserves. So the taste of the herring migrates faster in other products. The first thing you will have to start preparing the vegetables for the salad. The tubers of potatoes, carrots and beets should be well washed and boiled. It is necessary when cooking vegetables remember that potatoes need much less time than other root crops. So it is best boiled separately. Pour boiled root vegetables briefly in cold water. Thus, they will cool, it will be easier to peel them. Potatoes, carrots and beets carefully peel. Then using a coarse grater, chop the vegetables. To prepare the salad, each vegetable should be rubbed into a separate bowl. Now you can start preparing the toppings for the other layers. To do this you need to chop the herring from the preserves. Sour apples clear from the skin and core, grate and sprinkle with juice of half a lemon. Walnuts need to chop and lightly fry in a pan without oil, then chill. When all products for the fur prepared, you can proceed to the main action. On dish put a layer of potatoes, then a layer of onions. Pour them with oil preserves. The next layer in the coat you have to pay out-of herring should go a layer of carrots, apples and beets. And only now you can liberally coat it with mayonnaise. Upper herring under a fur coat, garnish with roasted walnuts. If necessary, all the layers in a salad you can repeat again. 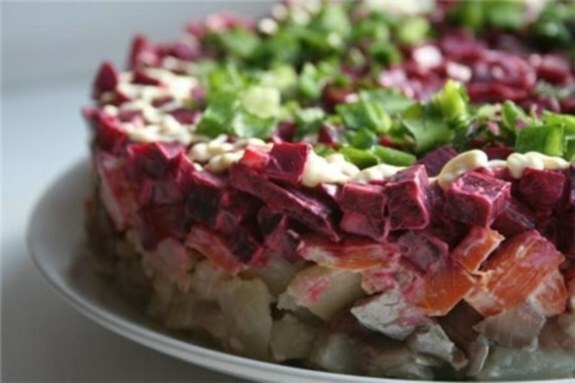 To finalize the herring under a fur coat, you can top the dish decorate with roses of boiled beets and carrots, supplementing them with parsley sprigs.